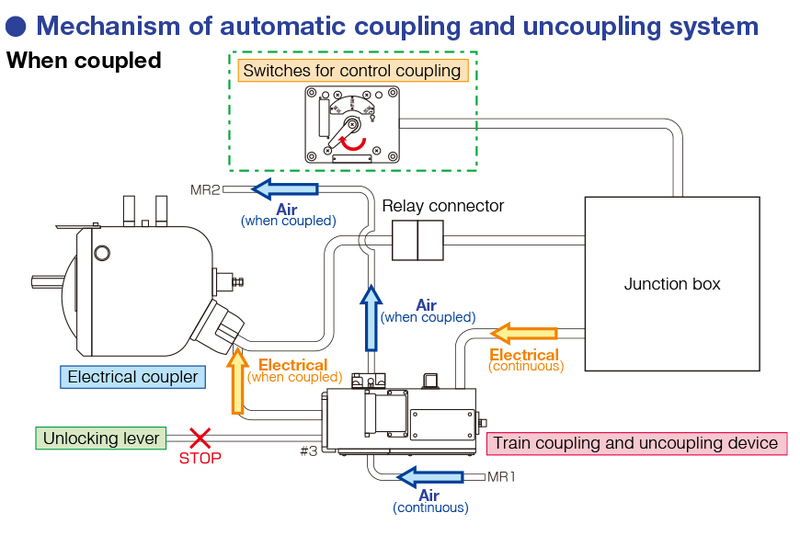 Automatic train coupling and uncoupling system | Yutaka Manufacturing Co., Ltd.
Our automatic train coupling and uncoupling systems perform resilient car reorganization operations by quickly and safely dividing and joining cars.The systems are made up of electric automatic couplers, train coupling and uncoupling devices, and switches for control coupling. 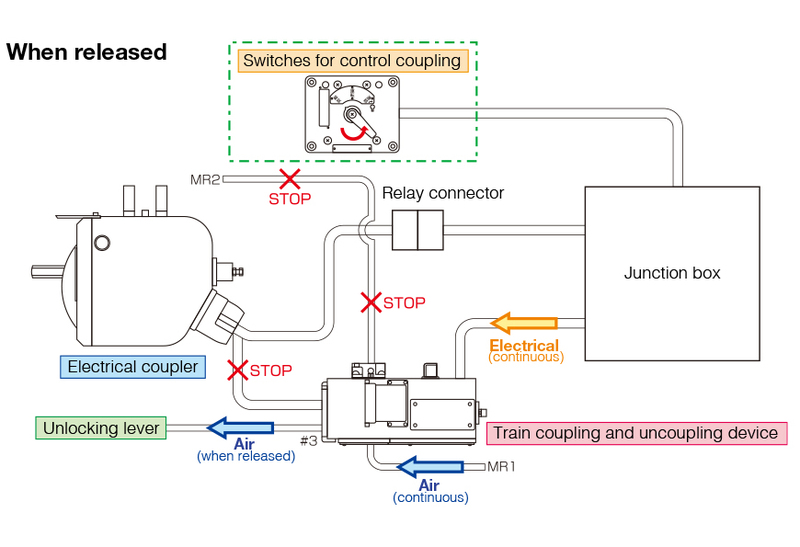 These elements enable automatic coupling and uncoupling of the cars to be controlled remotely by the train operator. 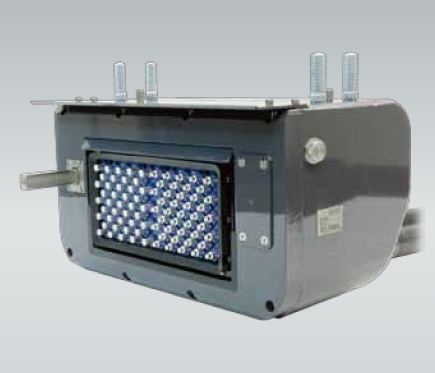 The electrical coupler can couple and uncouple train consists and also automatically connect and separate the railway car electrical circuits. Simplifies the structural parts, and makes it compact and lightweight. 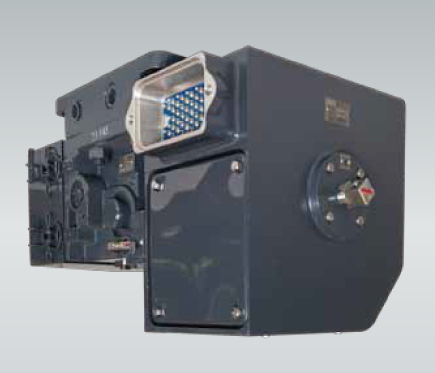 It is also equipped with waterproof performance and vibration-proof performance for tolerating use even under severe and adverse environmental conditions. 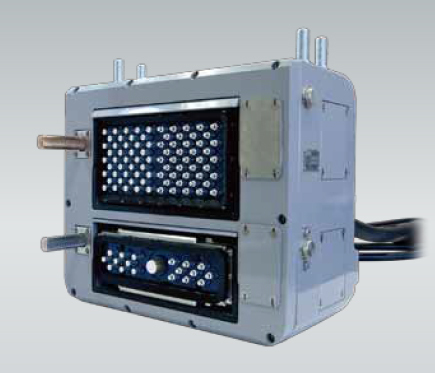 We have a wide variation to match the need, including electrical couplers mounting cold-resistant and snow-resistant equipment, as well as heat-retaining heaters, for cold regions, two-stage electrical couplers for meeting multiple contacts, and electrical couplers with Ethernet capability. Type fixing and mounting electrical couplers to contact couplers. In the mutual positioning of electrical couplers when coupling, this method involves leaving the positioning to the contact coupler. In contrast to the fixing method, where the contact point is positioned in accordance with the precision of the contact coupler, the main body is never completely fixed in relation to the contact coupler, and positioning of the contact point is performed by movement independent of the mechanical coupler through the use of springs, rings, and guide pins, etc., for coupling. This type is mainly equipped on automatic couplers, characterized by movement independent of the automatic coupler so that it can track centered deviations, etc., during coupling, and after the railway car coupling guide pins are used to perform positioning while an air cylinder, etc., pushes them together, for coupling. 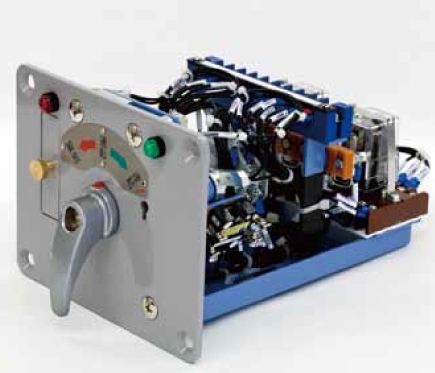 Our devices perform opening and closing operations on air circuits and electric circuits when train cars are coupled and uncoupled by an operation from the operator’s cabin.Various models are selectable according to the number of required circuits. Our switches transmit instructions to a train coupling and uncoupling device under the train car floor.These switches are typically installed in the operator's cabin.